Bestia’s consulting pizzaiolo, Noel Brohner, shares a recipe crafted specifically for the home cook. In this month’s issue, author David Hochman learns what it takes to make pizza Napoletana in his feature “Life of Pie.” Technically, authentic Neapolitan pizza can only be made in a stone, wood-burning oven that reaches 900 degrees. This has to do with the type of flour—Caputo’s ’00’—that is generally used and the desired consistency of the final product. But fear not, eager home bakers! We found a local pizza master who created a recipe for the home cook. All that’s needed is a stand mixer, some excellent ingredients, a cast iron skillet, an oven with a broiler setting, and the will to make it through the relaxing, fulfilling process of vera pizza Napoletana. Recipe and method created and adapted for the home cook by chef Noel Brohner, with inspiration and guidance from chef Ori Menashe (Bestia), Roberto Caporuscio (Keste, New York), Roger Gural (Arcade Bakery). Add cold water to the bowl of a stand mixer fitted with a dough hook. Add flour and then instant dry yeast to mixing bowl, taking care to let the layer of flour blanket the cold water and keep it separate from the yeast. Mix on low speed for about 2 to 3 minutes, stopping the mixer from time to time and scraping the bowl with a rubber spatula to remove dry flour from the sides and bottom of the bowl if necessary. Dough should be cool to the touch and the texture should be rough and somewhat shaggy—not smooth. Remove dough hook from mixer and cover entire bowl with kitchen towel for a 20-minute rest period. After 20 minutes, remove towel from top of bowl, re-attach dough hook, add salt to bowl. Mixing on low speed until salt is fully incorporated, about 3 minutes. If dough ball creeps up the dough hook, stop mixer, push dough down and continue mixing – repeat if necessary. After 2.5 to 3 minutes, dough should still be cool to the touch and a bit less shaggy, but still not smooth. Remove dough ball from bowl with rubber spatula or plastic dough scraper. Transfer dough into lightly oiled plastic container, cover with plastic wrap and place in the warmest part of your kitchen for 20 minutes. After 20 minutes, remove plastic wrap and, with wet hands, carefully stretch and fold dough over from each of four sides into the center, one side at a time, as if you are making an “envelope” out of a piece of paper. Once the fold is completed, turn dough ball over with seams side facing down, gently press the entire dough ball down, and then cover container with plastic wrap again. Repeat this same fold five more times at 20-minute intervals noticing that, with each fold, the dough becomes slightly stronger and the surface smoother. After the final stretch and fold, allow the dough ball to sit covered with seams side down for one more hour without stretching or folding. Once the hour has passed, lightly oil a new container with and then wipe down the container with a dry paper towel to remove any excess oil. Transfer the dough ball into the new container with the seams side down and cover tightly. Container should be large enough for the dough ball to double in size, though it may not double in volume. Place tightly sealed container into refrigerator until you need dough for pizza making (1-3 days is ideal but the dough can be kept in refrigerator for up to 5 days). Remove container from refrigerator at least three hours before you intend to begin baking. Weight out even portions of 260 g, or as large as desired. Return any unused dough to the refrigerator. Ball up dough portions and placed them into a lightly floured container seams side down and cover them while they rise. Have sauce, cheese, and toppings ready. Recipe for sauce follows. Pre-heat dry, seasoned 12-inch cast iron skillet on medium-high heat for about 15 minutes or until pan is very hot but not smoking. Once the dough ball is ready, place a metal oven rack about 6 to 8 inches from your broiler’s flame. Turn broiler to high. With pot holders in each hand, carefully transfer the hot pan into your oven, with the top edge of the pan about four to six inches from the ﬂame of your broiler. The surface of your pizza will cook very quickly. Close the oven door but check the after one minute to see if those “leopard spots” are forming and to make sure the crust top is not burning prematurely. If the top of the pizza needs a bit more color, leave it in the oven but check it often, about every 15 seconds or so. Once you are satisﬁed with the color of the pizza top, remove your pizza from the oven and place it back on the stove top. Check the bottom of the pizza again with the metal spatula for crust coloring. If the pizza bottom needs a bit more color, put the burner on high for between 15 seconds and a minute. Process whole, canned San Marzano tomatoes with a hand food mill. Add 2-3 grams of salt per 24 ounces of tomatoes. For a thicker, less ‘soupy’ tomato sauce, drain tomato water before processing tomatoes. Use sauce “raw”—unheated. 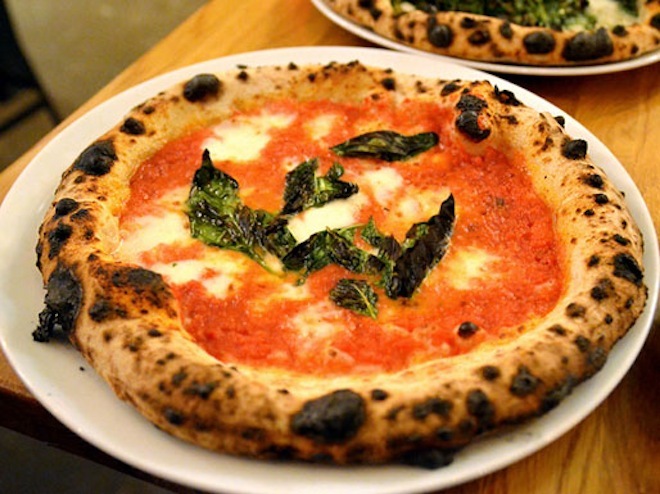 Special thanks to consulting chef Noel Brohner at Bestia and Kelly Bone, resident pizza expert at Serious Eats.